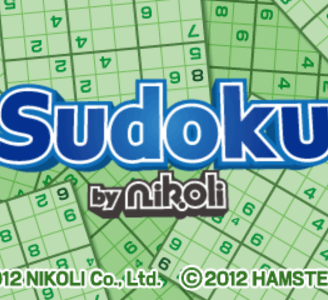 Sudoku by Nikoli, known as "Nikoli no Puzzle: Sudoku" in Japan, is a sudoku puzzle game developed and published by Hamster Corporation. The game features 50 sudoku puzzles and a mode called "Stage Clear" in which the player progresses further by solving a sudoku puzzle on each stage. A second mode called "Random" randomly generates puzzles. Sudoku by Nikoli runs without any significant speed degradation on good hardware. There is an issue that corrupts the save file but does not hinder gameplay.